A new alliance has formed in the depths of Gielinor’s ocean. 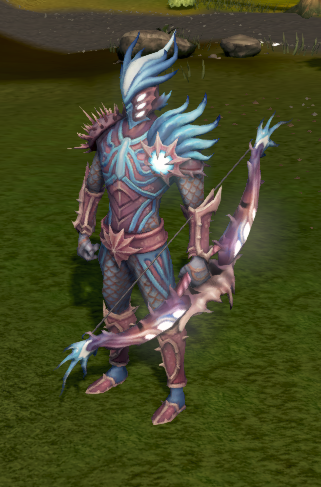 First to appear on land, the Ocean’s Archer outfit will soon be available for all adventurers. The tokens can also be traded before redemption, if you’re looking to complete your set quickly. More of Ocean’s outfits will be arriving in the coming months, with the Archer just the beginning. Good start, but this should've been placed on Solomon's store. Agreed. give me back that filet o'fish! give me that fish! It is good to agree sometimes. give me back that filet o'fish! give me that fish! I agree with Ahura ik it is cosmetic I just wish as the game get progressively pro-jagex we need to have better armor and weapons regardless of those crying its too op ....you dont see the ninjas nerfing a nox bow and the much needed staff do you ? Everyone wants TH to be more cosmetics promos and not xp promos, and when it is a cos-promo everyone just complains and say that it should be in soloman's store. No wonder they cant get it right, its because everyone is contradicting themselves.